Three months.Five missing young girls.Two bodies found.Two possible serial killer connections.No arrests. Two possible serial killer connections. 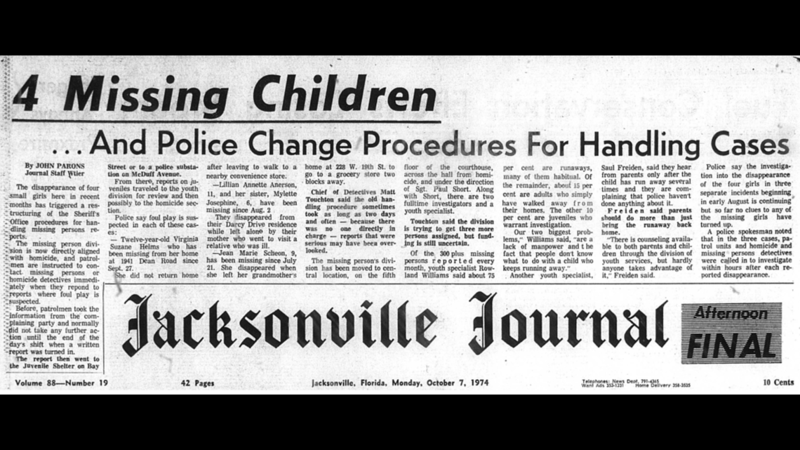 In the summer of 1974, the sun was hot and it was Florida-humid in Jacksonville. Barbra Streisand was crooning "The Way We Were" on the radio. Kids were out of school, riding bikes, swimming in pools and hanging out at the corner store with sweaty brows. Things took a turn in July giving way to a terrifying three months. Five little girls would go missing. 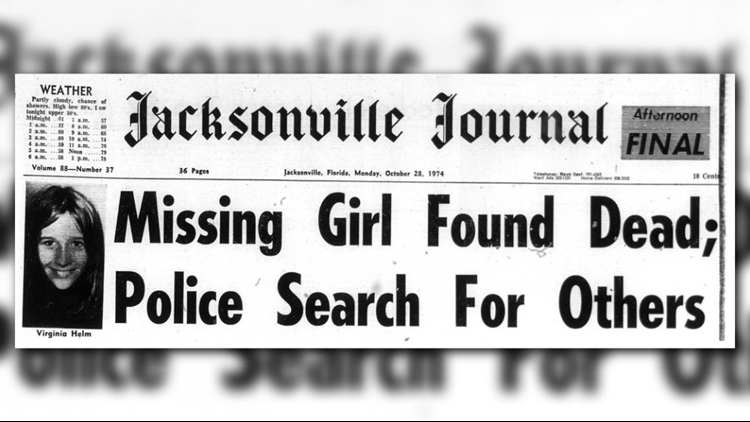 Decades later, Jacksonville investigators are still clueless as to what happened to them. 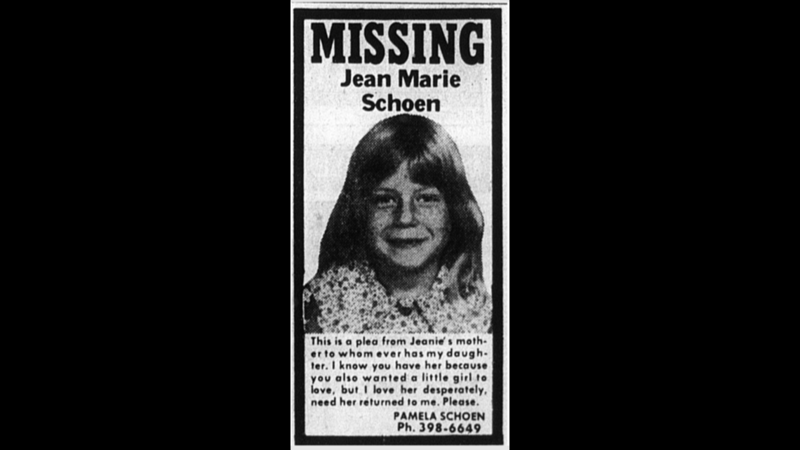 Jean Schoen, known as Jeanie, 9, was asked to go to the store for a pack of smokes for her uncle. The store was just two blocks away from the house. The clerk told investigators that Jeanie purchased the cigarettes, but forgot them at the store. She returned to retrieve her purchase, the clerk said. Jeanie told the clerk that she was going to go to a place called The Hangout with the change from the smokes to play pinball. The owner of The Hangout saw Jeanie and told her that they were not open because he had just cleaned the floors. He told her to come back when the floors were dry. Two friends of Jeanie said they were all together at the laundromat near the Winn-Dixie in Springfield when a man they didn't know approached them on a blue bike. He grabbed Jeanie and pulled her into the restroom with him. When they came out of the bathroom, Jeanie was crying and the man rode away with her on his bike. The girls tried to run after them but they couldn't keep up. The girls told investigators that Jeanie didn't scream for help or attempt to fight the man off. He was described as white, with light colored hair that was styled kind of like Elvis Presley. Sgt. Dan Janson with the Jacksonville Sheriff’s Office Homicide Unit, recently told First Coast News' Katie Jefferies that there was nothing to indicate that Jeanie ran away. “She wasn’t a troubled child,” he said. 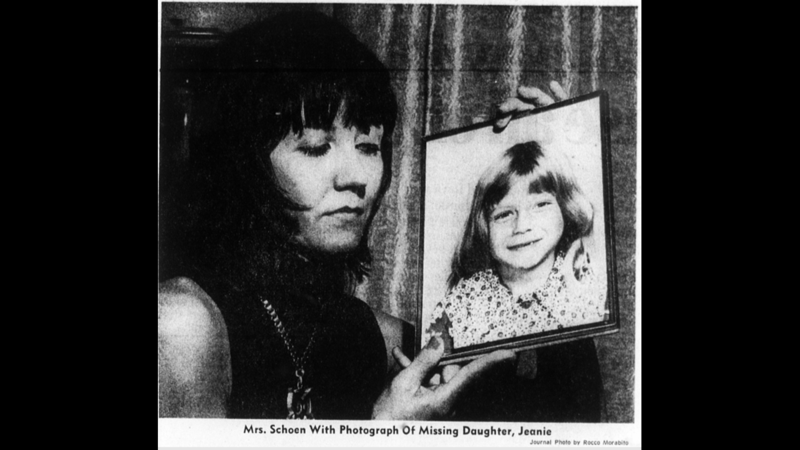 Pam Schoen, Jeanie’s mother, took out ads in the Jacksonville Journal pleading for her daughter back. The advertisement shows a black and white photo of Jeanie smiling. 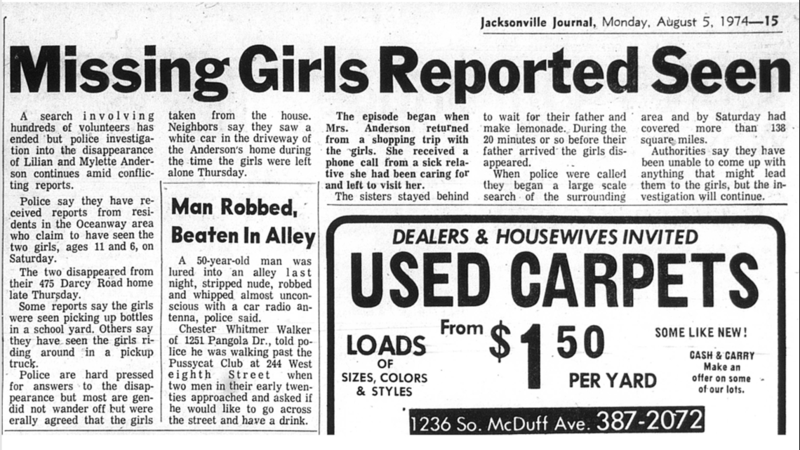 Annette and Mylette Anderson were taken from their Jacksonville home on August 1, 1974 -- less than two weeks after Jeanie's disappearance. “This case is quite a tragedy,” said Sgt. Janson. Annette was just 11, and her little sister Mylette, just 6. They were left alone only briefly when their mother Elizabeth Anderson, and their older sister Donna went to visit Elizabeth’s sick sister. Their father, Jack, was headed home after a day of fishing. He even called home and spoke to the girls to check on them at 7 p.m. Jack could hear the dog barking in the background of the phone call, but Annette assured him the dog is barking at birds in the front yard. When Jack called again at 7:20 p.m. no one answered the phone. Police believe that in this short 20-minute window the girls went missing. The girls' father returned home to find the family dog locked in a back bedroom and Mylette's favorite doll - the one she carried everywhere - also missing. 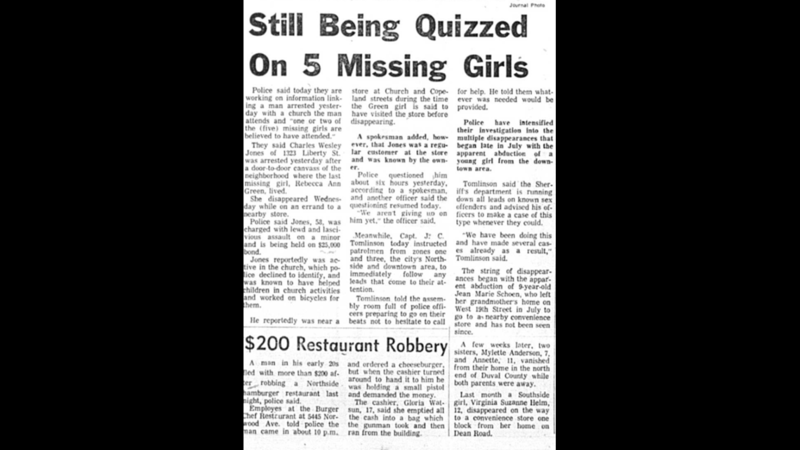 Volunteers and officials searched for the girls for days. A local paper reports that more than 100 square miles were searched in an effort to find them. 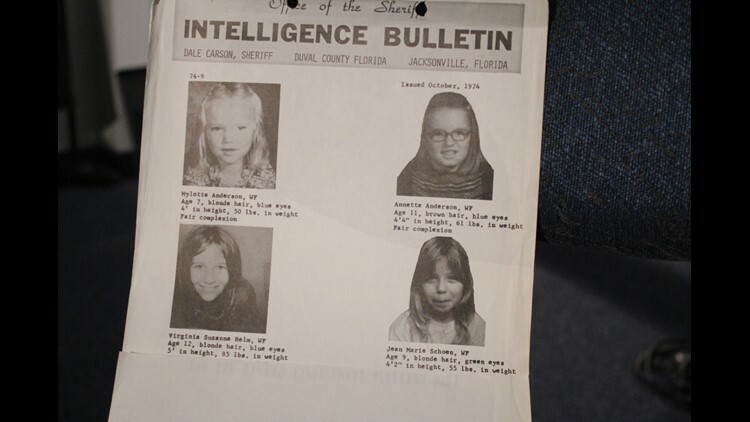 Some witnesses said they saw the girls in the days following their disappearance. Some said they saw the girls riding around in a pickup truck, another said they saw the girls picking up bottles in a schoolyard. But neighbors said they saw a white car in the driveway of the Anderson home around the time the girls went missing. 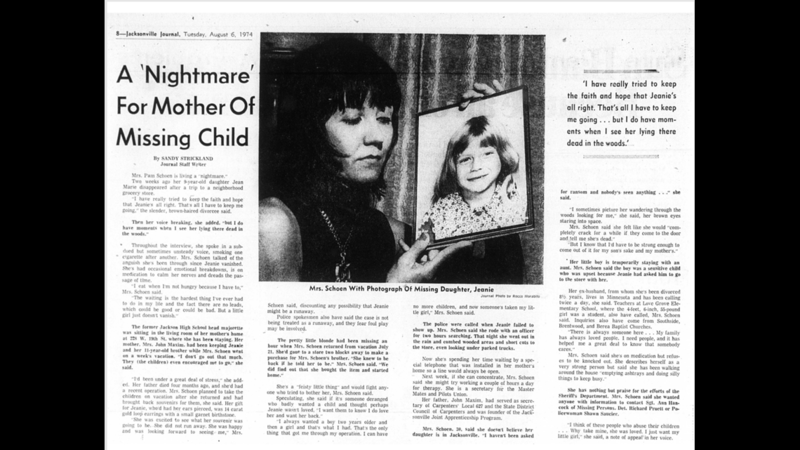 Donna Jeffers (Anderson) remembers the day her sisters went missing with clarity. Donna believes whoever took her sisters must have had some plan because the family lived on a secluded road with only one way in or out. 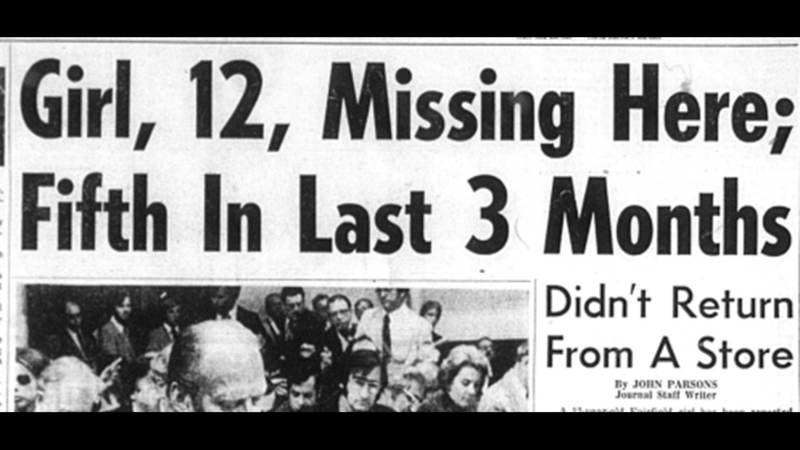 The first mention of a serial killer in this series of disappearances comes up in the Anderson Sisters Case. John Paul Knowles was a known serial killer in Northeast Florida at the time. He was killed as he attempted to escape prison. Before he attempted to escape he wrote a letter about some of his victims and claimed that he was responsible for the disappearance and murder of the Anderson sisters. He said he left their bodies at the end of Commonwealth, but police scoured the area and never found either of the girls. “I can’t say that he is responsible for this,” Sgt. Janson said. “I am leaning toward he is not. 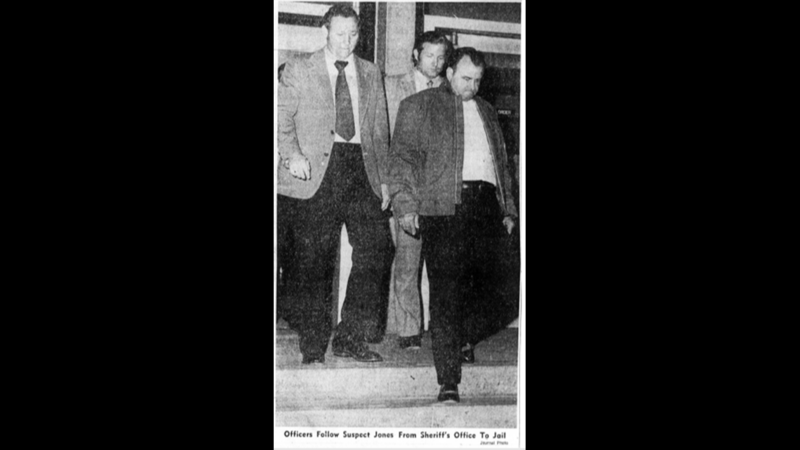 It is a false confession just based on some of the facts that we know of this case.” Knowles was known for embellishing the number of victims he had killed for shock value. The Andersons held out hope that their two girls would return home. Jack died before his wife. He was buried beside a marker for Annette and Mylette that has a birth date, but no death date. Sadly, Elizabeth died before her daughters or their remains were found. 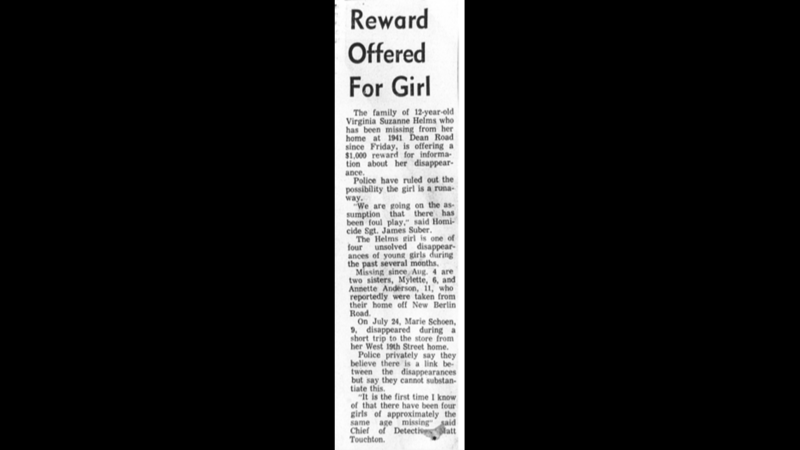 Virginia Helm was on her way to the store for soap when she disappeared. Forty-five minutes after she left home, Virginia’s father became worried about his 12-year-old daughter and went looking for her, but he wouldn’t find her. A search was conducted and many people were interviewed. Some witnesses reported seeing a red compact vehicle. This car would become important when, three days after she disappeared, a couple came upon a troubling scene. A red VW Bug was pulled over to the side of the road New Kings Road near the Nassau/Duval border. A couple approached to see if the man needed help. In the backseat, they spotted a young girl, matching Virginia’s description, with her knees on the floorboards and her hands on the seat as if she was attempting to get up. Her pupils were dilated, she was looking back and forth rapidly as if she was scared, but she didn’t say anything. When the couple confronted the man, he took off in a rush leaving behind a bag that fell out of the car. Ted Bundy, who would kill a girl in Lake City in 1978, was said to drive a VW Bug. The connection has been taken into consideration. He was, however, committing murders in Washington state in 1974. The bag was collected to be processed for fingerprints in 1974, but now it could be tested for DNA. Just a day before Virginia went missing, her friend Mary Anne was approached by a man in a red car who told her to get in or he would kill her. She ran for help instead, according to detectives. Mary Anne described Virginia as a quiet girl, but very kind. “Virginia Helm was found murdered and buried in the woods near Beachwood and Beach Boulevard,” said Sgt. Janson. She was found shot in the head with a .22 on Oct. 25, 1974, partially buried in the dirt and only wearing a blouse. 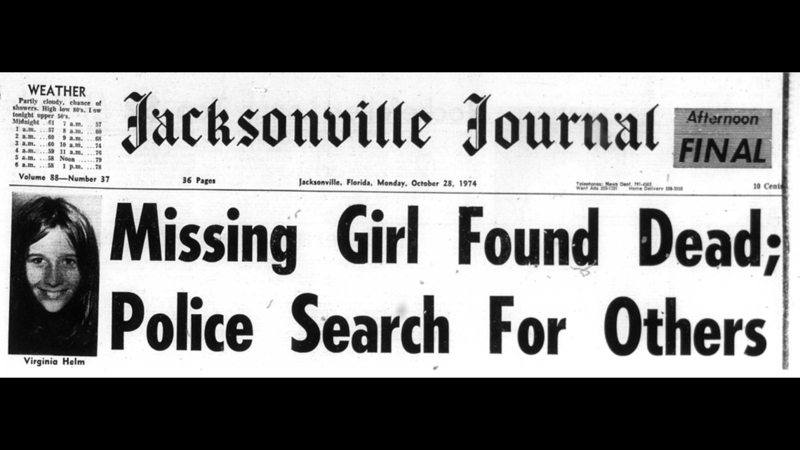 Because of these cases, the Jacksonville Sheriff's Office decided to re-organize and move all missing persons under the homicide unit. Twelve-year-old Rebecca Greene was headed home from the store, only five blocks from her home, when she vanished without a trace like the four girls before her. She made it to the store, according to the clerk, but she never returned home. Searches for her turned up nothing. 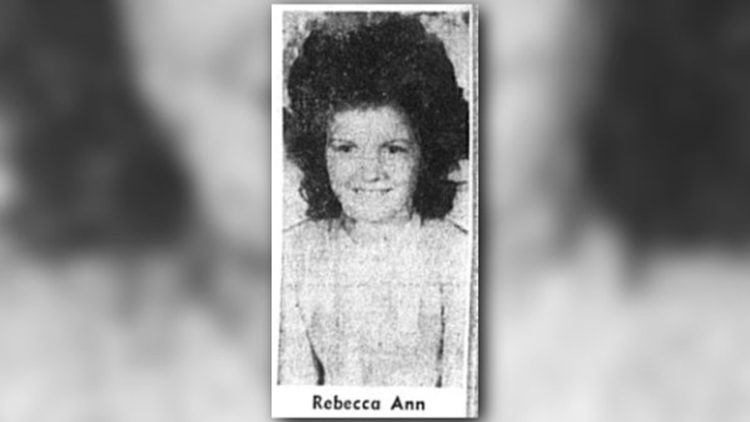 Rebecca wouldn’t be found until three years later when her skeletal remains were located off Fort Georgia Island near the mouth of the St. Johns River in the summer of 1977. With Rebecca being the fifth missing girl in three months, police were in a hyper-vigilant state of mind. One of the detectives cut hair from her remains and put it into a plastic baggie and placed it in her file. This hair can now be tested to see if there is DNA that can be lifted off of the hair. 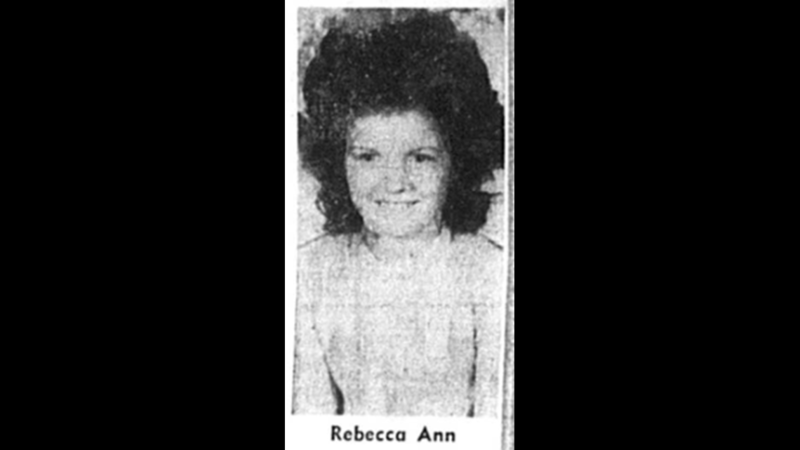 If police are able to find DNA that is not Rebecca's, it would be a major find in a four-decade-old case. 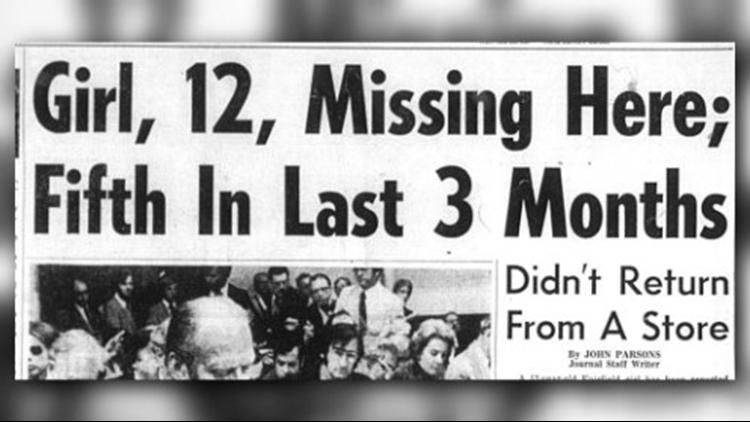 The summer of 1974 should have been as carefree as the ones before it, but instead, families were locking their doors, waiting for their children to come home anxiously and four families were waiting for their girls to walk back through the door. 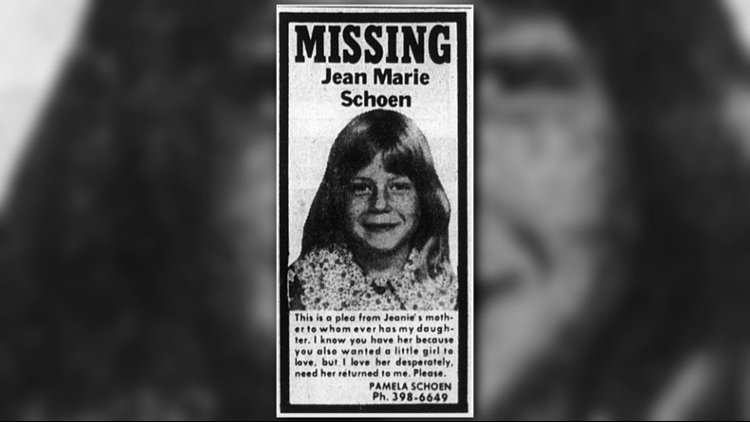 Despite newspaper articles at the time stating that the police had nothing to connect the disappearances together, a note at the end of Jean Schoen’s report shows Detective Janson and his team that all those years ago the lead detective had his suspicions. A note was written in Jean’s file about the other girls, not directly connecting the cases, but making sure any future detective looking into the case knew about the other disappearances. 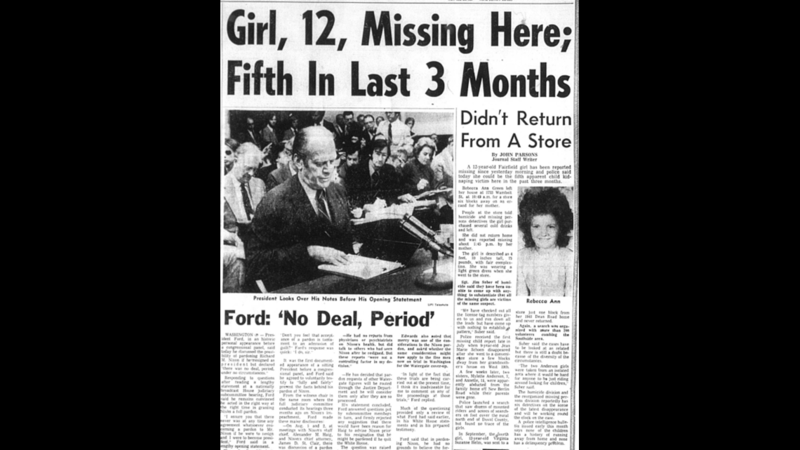 In a strange twist, Lester Parmenter, one of the lead detectives on the cases, own daughter was approached by a man believed to be Ted Bundy in the familiar red VW Bug in 1978. His daughter was able to get help and take down the license plate number of the vehicle. When Bundy killed his last victim, a 12-year-old girl in Lake City, Florida, that license plate number helped to find him. Nearly four decades later, police are still working to solve the crimes against these five girls in during those three grisly months in 1974. 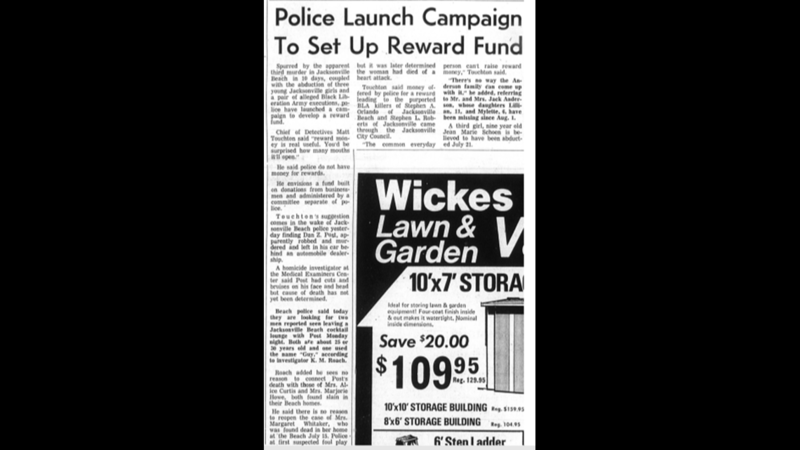 As it stands, the cases of Jean Schoen, Annette and Mylette Anderson, Virginia Helm and Rebecca Greene remain unsolved. The Jacksonville Sheriff's Office Cold Case Unit says it is taking a deeper look into the cases and following any possible leads and bringing the cases up to the investigative standards of today. In conjunction with JSO, Project Cold Case is working to help contact existing family members to provide support and advocacy. It also runs a searchable Cold Case Database to help cultivate leads for law enforcement.